This post is part of a series that begins at Basic Home Networking, Routers and Switches. If you are new to networking, I suggest you start there. That article deals with wired networks; this will cover wireless devices. As noted before, I can't anticipate every single problem you might run into while trying to setup a wireless device. However, over many years, I've certainly seen many common and not so common problems, so you might get lucky and find a solution here. If not, perhaps something I do mention may give you a hint that will help you solve your problem. You might not have any problem at all. 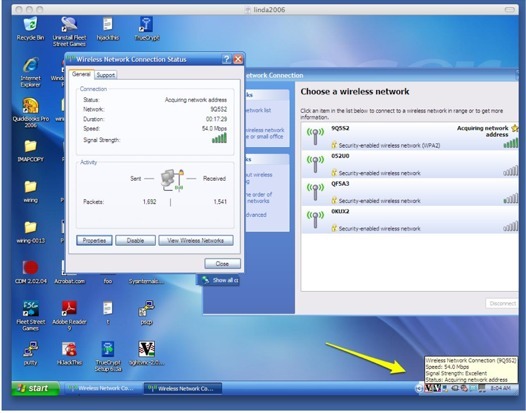 Often all that needs to be done is to tell your computer that you want to connect to a wireless network. It's not always that easy, but it certainly can be. However, even if it is that easy for you, you might still want to read the rest of this in case you have problems later. While a wired network will likely just keep on working, wireless is a bit more fragile and what worked today may stop working tomorrow. You also might want to read this because being "easy" to get connected might just mean that you are running some security risk and need to address that issue. Most wireless capable devices sold today have some sort of "Wireless Setup" control built into their software. Finding that can sometimes be difficult and confusing: there may be multiple ways to accomplish the setup and while it is possible that any of the choices will work, it's also possible that one of them is incorrect for what you actually have. Those are unusual situations, though. On Mac OS X, you'll see the "Airport" icon at the top of your screen. If you select the "Turn on Airport", you will see available wireless networks and can see more detail by opening the "Network Preferences" dialog. 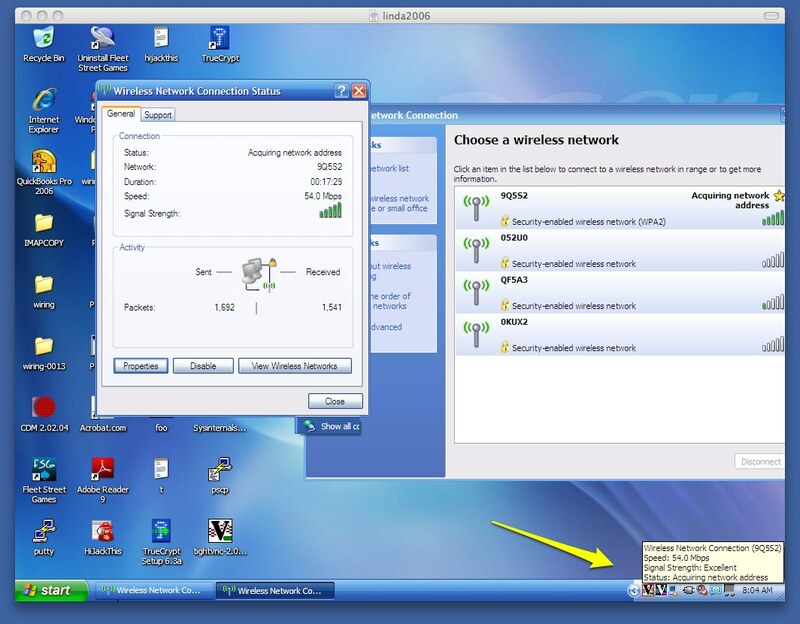 Windows can also have a network icon in the "System Tray" at the bottom of the screen. If that's missing, see "Missing network icon on windows Systray". You could also open Control Panel and click on "Network Connections" to find your wireless control program. However, Windows can be tricky. You may have an entirely separate Wireless Setup icon in your control panel. Worse, there may be two or more programs on your computer for setting up wireless connections and only one of them is the one that will work successfully. This is not usually the case on newer systems, but watch for this if you run into something older. On most modern Windows laptops, there is also a wireless control button or key that has to be turned on to enable any wireless access and which may or may not call up the control program additionally. The location of this key can sometimes be challenging: it is usually marked with some sort of visual indicator that is supposed to make you think of a radio tower or something like it. If it is tied to a function key, you will need to hold down some modifier key (sometimes marked "Fn") before pressing this. However, I have e seen this button cleverly hidden on the side of the laptop where you might never think to look! Other devices will have other methods. 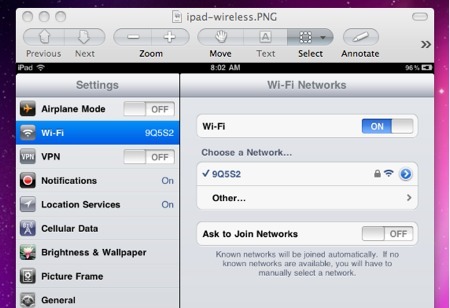 The picture below shows an iPad network setup screen ; that's found in Settings -> General -> Network -> WiFi. If more than one wireless network is in range, you will almost always see some indication of signal strength along with the name (the SSID) of the network. If you don't know which network is yours, it is most likely the one with the highest (strongest) signal. In a public area, that might not be true, so it really is best to know the SSID of the network you want to use. You may not need to know anything about channels. Usually your computer will sort that out by itself. However, if you are in relatively close quarters to neighbors, you may want to deliberately choose a channel number other than one they are using because their use can slow your network down (you'll be slowing them down, too, of course). This is a change you'd need to make at your computer AND at your wireless router (or wireless access point). As router configuration varies widely, I cannot begin to cover that here - Google for your brand and model (or call your ISP if they provided the device). Did you know that certain channels are illegal in specific countries? That shouldn't be an issue unless you have equipment made in some other country, but there is not one channel number that can be legally used anywhere in the world. Channels 10 and 11 come close to ubiquity but are illegal in Israel! 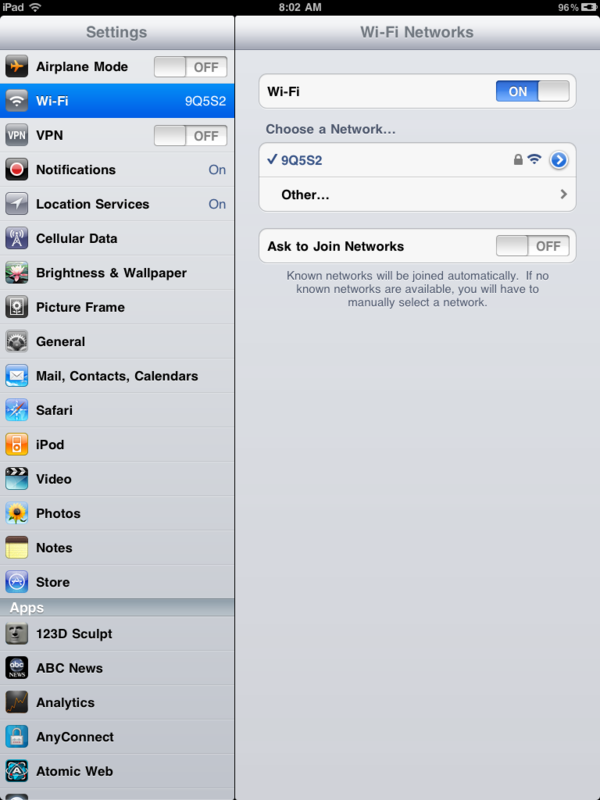 The SSID is the "name" of the network. If you do not know what yours is, it might be very easy to find. For example, Verizon routers have the SSID printed right on the router as shown in this picture (though the default name can be changed, of course). They also tell you the security method (WEP, which is not a good choice; we'll get to that later) and the key, which is the password you would need to gain access to the network. Note: Yes, that is my home router. No, I do not use that security method or that access key.I changed that almost before the Verizon installer had finished packing up to go. SSID's can be hidden. That is, the router or access point will not make its presence known. In a case like that, you would need to know the name you need to use. That's not typical, but keep that in mind if you are not seeing anything nearby. By the way, most experts agree that there is no value to hiding SSID names. Many other so called wireless security methods catch equal disdain. Simply using the strongest encryption available on your device is your best defense. That's probably WPA/2 (at the time I am writing this, anyway), but check your router's documentation to be sure. If you need to get into the router to change or discover wireless settings, you will need a password for that. Again, you may be able to get that information from your ISP. If you cannot, most routers have some easy method of resetting everything to defaults. That might be as simple as a tiny button you push in with a pencil point and hold for several seconds. It might not be, though: some routers require attaching a serial terminal and rebooting with some special command entered at a specific point - again, router documentation will tell you. Google for "reset YOURBRAND router". If I wanted to reset my Actiontec router, I'd search for "reset Actiontec router" and would quickly find articles that showed me where the reset button is and what the default password is. WARNING: If other devices are already configured on the network, resetting a router like this could easily prevent them from working. If you are not techy enough to handle that, don't even consider it. Your wireless network is probably protected with at least basic security which will require any connection attempt to provide a password or "key" before it will allow joining to the network. If it does NOT require that, it is an "open" network and may simply let you join without any challenge. If your home or office device is setup that way, any person with a wireless computer can connect to your network and might then be able to access files on your computer(s) or even install virus software and so on. You do NOT usually want to be running an open wireless network! However, some security methods aren't all that much better than open. 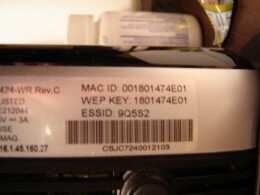 For example, the default Verizon setup described above uses "WEP" security. WEP is unfortunately very easy to hack. The Verizon router shown in the picture does support the far better WPA/2 security - I changed mine to use that, instead. Wireless security is a matter of some concern. Your router or Wireless Access point should be set to the highest security possible, but of course that might change. I'm writing this in December of 2010, you might be reading it years later. WPA/2 is a good choice as I type in this sentence; it might be a bad choice when you read it. Whatever the security method is, if the network is not open, you will need a password or key. You may have to login to the router to get that (or reset it) or call your ISP (Verizon, Comcast, whomever). If you are near the wireless device, you probably have excellent signal strength. What if you are some distance away or behind walls? One thing that you might want to be aware of is that there are different wireless speeds available. As a general rule, higher speed networks use higher frequency radio waves. Faster is better, right? Well, not always. Which travels farther, low frequency sounds or high frequency? Which passes through walls easier, bass or treble? It's the same idea with wireless. Many devices today can handle both low and high speed networks; if you are having connection difficulties, switching to the slower way might help. In any case, you should probably attempt your initial connection while being very close. Why look for trouble? Get it working nearby and then try moving to where you really want to use it. Wireless printers, once unheard of, are starting to be come quite common. I set up a Brother MFC-J615W printer recently and had some small difficulties with the wireless setup. The solution was to temporarily connect it using a network cable, program the wireless configuration, and then move it into place. Wireless print servers can also be used to turn a older printer into wireless. Another formerly wired device that is now offered in a wireless model is security surveillance cameras. Having these wireless gives you much more flexibility as to their location. If your current router does not support wireless, you don't necessarily need to buy a new router. You can buy a "Wireless Access Point" and attach it to your existing network. If you are having problems reaching some part of your home, these things usually can function as "repeaters" also, which extends your wireless range. You can buy and install a wireless card or even a USB device that will not require opening the computer at all. These will either come with software you need to install or will simply be seen by the operating system automatically. Finally, I want a plug for an excellent little book called "The Book of Wireless" by John Ross. I really admire authors who cover technical subjects completely and yet remain understandable to non-technical readers. If you want to get into wireless in depth, this book is an excellent place to start.